After Many months of work our new 5 year plan nears completion. There will be a Major Launch night of our plan on the 13th of April in Edenderry GAA Clubhouse, there will also be special guests in attendance on the night. This year we are offering members the opportunity to play our Development Lotto for the year at a discounted rate when they pay membership. The higher your membership fee, the greater your lotto discount. Ladies membership can also be paid to any ladies committee member or any Friday night in St.Mary’s secondary school hall between 5pm and 7pm. Final Date for club membership payment is the 31st March 2017. Thanks to all our participants who took part in the annual Edenderry Saint Patricks Day Parade. Bingo and Lotto draw takes place every Sunday Night at 8pm in the Clubhouse, Doors open at 6:45 ample supervised car parking on the GAA grounds. Over €4000 in Bingo prize money must be won. There was no winner of the Lotto Jackpot at tonight's draw. 1 players matched 3 numbers and won €200. Congratulations to Seamus Kenna Carbury. Draw takes place on Sunday night at Bingo. Congratulation to Colm Cummins who won a GAA Nursery pack from the Leinster Council and this was presented to the club last Saturday morning at our successful “Have a ball” programme by Keith McGuinness. Well done to our U16 Footballers who had a victory over Na Fianna, on a score line of 2-11 to 2-09 last Thursday evening. Offaly put up a much improved performance against Tipperary, Unfortunately they were unable to achieve a victory and lost out on a score line of Offaly 2-11 Tipperary 2-15. On the offaly panel from Edenderry were Sean Doyle, David Hanlon, Adam Mahon and team captain Sean Pender. Congratulations to the Offaly U21 on their victory over Laois in the Semi-final of the Leinster championship on a score line of Offaly 2-09 Laois 2-08. They play the winners of Dublin or Longford in the Leinster final. 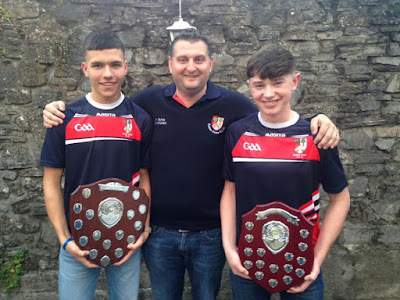 On the Team from Edenderry were Adam Mahon and Ciaran Farrell who both scored a goal each. Jordan Hayes lined out at midfield. Offaly seniors played Tipperary in the league on Saturday Last in Ballycumber, the final score was Offaly 0-07, Tipperary 5-07. Offaly Minor’s played Westmeath on Saturday in the Leinster Minor A Championship, unfortunately they went down on a score line of Offaly 1-05 Westmeath 4-18. Despite a great battle from Oaklands they lost to Belmullet on a scoreline of 1-07 to 0-07. Commiserations but we are very proud of your efforts within Edenderry GAA.